The Overstrand Learning Academy is a primary school, and also runs accredited skills courses in Hospitality and Tourism, Early Childhood Development, PASTEL [OLA is the only accredited PASTEL trainer in the Overberg] . It serves the whole of the Overstrand community and currently has learners from Kleinmond, Hawston, Hermanus, Zwelihle and Mt Pleasant. Some of the courses are now also being offered in other parts of the Overberg. It is presently based at Berghof, but as the academy grows, it will have to find alternative accommodation. Learners had to perform certain challenges in order to get clues as to what places to visit and what excursions to go on. Excursions included a very informative tour of the HONINKLIP dried flower farm – where Richard Middelman showed the learners how dried flowers are processed for export. Even the teachers and parents learnt a lot from Richard’s tour! Learners then headed out to the Kleinmond Lagoon to compete in a paddle boat challenge – here they were made to fetch clues on the other side of the Lagoon – these clues sent them on their OLA – Overstrand Learning Academy, a private school based in Berghof, Hermanus came to Kleinmond to do an Amazing race challenge on Friday the 23rd of February. way to Bee and Kei’s Honey Factory in Harbour road. After learning about how honey is processed, they decanted their own honey and had to sell it to the shops in Harbour road in order to get their next clue to the next challenge. Bella Bella, Peace and Plenty, Interior Mart, Harbour Place Coffee Shop and Sunshine Trading, all obliged to make it a very educational experience. The next stop was the Penguins at Stony Point – here learners learnt more about penguins. After a hard day of challenges everybody met at the Kleinmond lagoon for a picnic lunch. Everyone enjoyed a glorious day visiting the wonderful sights in our biosphere – reminding us all of how lucky we are to live out in this part of the world. OLA would like to thank all those local businesses who helped make this such a successful outing. 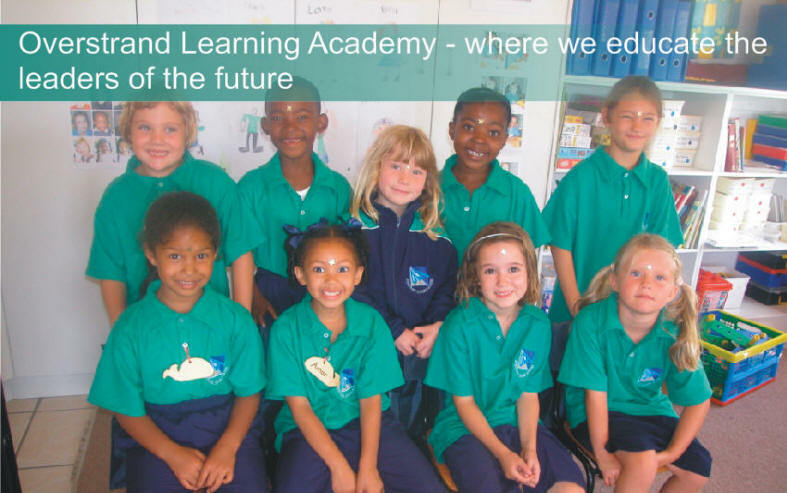 Berghof School has evolved to become Overstrand Learning Academy (OLA) and should not be confused with the Overstrand Institution of Technology. Much has happened since Molly Venter became principal at the beginning of the second term and she believes in open lines of communication and parent partnerships. “Academy stands for post and pre-education”, something Molly, who was rector of the Pretoria college for nine years where she had a student body of 12 000 and a personnel of 370 is passionate about. Her mission is to educate people to be a valuable person in the community. OLA is in the process of obtaining full accreditation from Umalusi and they are the only Academy that can offer Pastel courses. (They received full accreditation for these courses in the beginning of June). Specially trained Pastel personnel are busy with the first course that was fully booked and the second course will commence on 26 July and entries for this course have already started pouring in. OLA is offering a course starting in the first week of August for Edu-Care training. Molly explains: “We train teachers for pre-school as we are SETA accredited and the training is 2/3rds practical and 1/3rd theoretical.” These classes are presented in the afternoon and OLA will place students that are unemployed for practical work. “Berghof is an exemplary example of pre-school teaching,” adds Molly. This brings us to the collaboration between the Abalone Restaurant, Arabella and the Overstrand Learning Academy. The kitchen at the restaurant is being upgraded in order to receive full THETA accreditation and although it is a training restaurant it will operate as a functional restaurant. Students here will also quality in event management as the vision of OLA and Arabella is for them to be able to plan an entire event, from costing, table decorations and drinks, to the food choice on the menu. The restaurant will be hosting their second group of tour operators and are planning on making certain dishes on the menu unique to the Overstrand. The Abalone Restaurant is fully geared to serve as a venue for birthday functions, anniversaries, stork parties, weddings and parties interested in offering workshops and they will provide refreshments. During the whale season, when the demand for staff is so much higher, OLA will be able to provide fully trained staff. Their training will encompass customer service, something Molly regards as fundamental, and will extend to core standards, hygiene, food preparation with a focus on fast food training, the making of fast food and also the selling thereof. Courses are offered for bar attendants, chef assistants, fast food and fast food service assistants, counter attendants and public area cleaners. Courses for room attendants for hotels and B & B’s are also offered, concentrating on service skills as well as courses for laundry attendants. A working guest house in Onrus, owned by Magda de Kock, forms part of OLA’s practical training and is an example of Molly’s vision of offering students the opportunity to become entrepreneurs themselves through training. The provincial, national and international guiding courses will produce well rounded tourism guides. OLA also offers a Business Skills Course and for a group of ten or more, a lecturer will come to your premises should you be in Gansbaai or Stanford. In fact, anybody can ask for a course and OLA can put one together to suit your business’s particular needs. Further computer courses offered is Pastel, Introduction to Computer (beginners) and then they offer a special course to introduce people to the wonderful world of the internet, i.e. sending mails. Beginners, intermediate and advanced courses are offered on MS Word, PowerPoint, Excel and Pastel. Pay a visit to OLA where the idea of life-long learning is being applied! Molly has been invited to address EVFET, European Vocational Further Education & Training at the end of the year and a group from America, Who Cares, asked for her assistance with the establishment of schools and colleges in Angola. 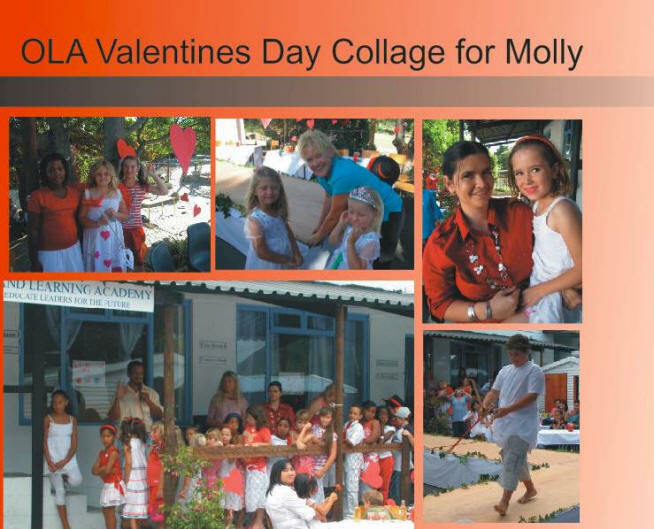 Hermanus is proud to have you Molly!